Solving the Mystery of BABYLON THE GREAT is the only book in print that examines the historical evidence in light of scripture and proves that the Roman Catholic Church was established by crypto-Jews as a false "Christian" front for a Judaic/Babylonian religion. Solving the Mystery of BABYLON THE GREAT explains the adoption by Jewish rabbis of the heathen occult practices of Babylon. Jesus criticized the Jews for practicing that Judaic/Babylonian amalgam religion. The Jews in turn sought revenge against Jesus and had him crucified. After the crucifixion of Christ, the Jews continued their attack against Christ by going after his disciples. From the beginning, the Christian church was in a spiritual struggle against Judaism. Judaism could not win in a head to head spiritual contest against Christianity. It was necessary for the Jews to throw their efforts behind undermining the Christian church by injecting it with a Judaic contagion. Their long-term strategy was to change the Christian church from the inside-out to align more closely with the Judaic/Babylonian theology. The Jews could not change the true church of Christ, but the Jews succeeded in creating a false church, a heathen church, a church that appeared to follow Christ but was in fact an antichrist church. That antichrist church is the Roman Catholic Church. Solving the Mystery of BABYLON THE GREAT tells the story of the creation of that Judaic/Babylonian church that became the Roman Catholic Church. Solving the Mystery of BABYLON THE GREAT reveals a massive satanic conspiracy against God and man and exposes the heretofore secret evidence that proves that the Roman Catholic Church is the great whore of Revelation known as MYSTERY, BABYLON THE GREAT, THE MOTHER OF HARLOTS AND ABOMINATIONS OF THE EARTH, who is drunken with the blood of the saints, and with the blood of the martyrs of Jesus. 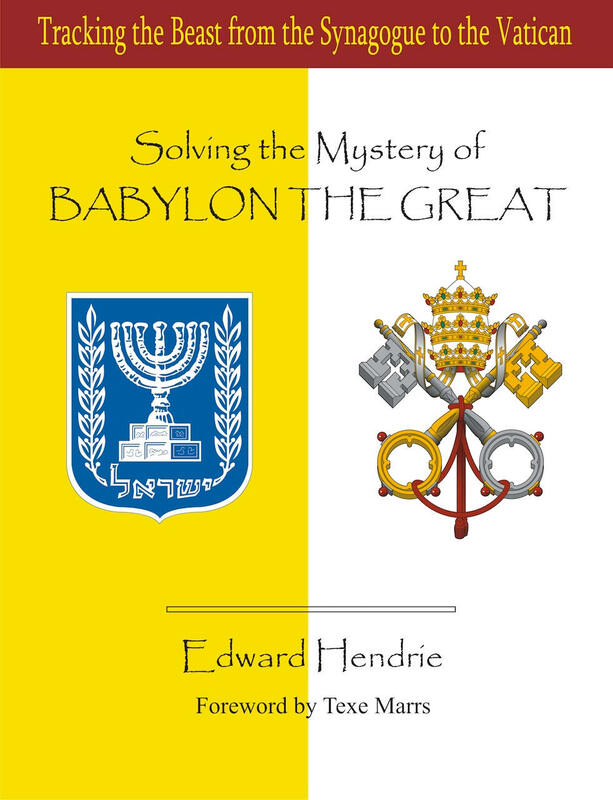 Solving the Mystery of BABYLON THE GREAT is packed with documented evidence; the book contains over 900 endnotes. .
Edward Hendrie has been given a very special gift of discernment, and I believe his book provides evidence of this. For centuries the saints have sought to uncover the symbolical secrets of the Great Harlot and the Beast of Revelation. Who is Mystery Babylon? What is the meaning of the sinister symbols found in these passages? Which city is being described as the "great city" so full of sin and decadence, and who are its citizens? Why do the woman and beast of Revelation seek the destruction of the holy people, the saints and martyrs of Jesus? What does it all mean for you and me today? Solving the Mystery of Babylon the Great answers these questions and more. Edward Hendrie’s discoveries are not based on prejudice but on solid evidence aligned forthrightly with the "whole counsel of God." He does not condone nor will he be a part of any project in which Bible verses are taken out of context, or in which scriptures are twisted to mean what they do not say. Again and again you will find that Mr. Hendrie documents his assertions, backing up what he says with historical facts and proofs. Most important is that he buttresses his findings with scriptural understanding. The foundation for his research is sturdy because it is based on the bedrock of God’s unshakeable Word.